It's finally here!! The big reveal!! So......what do you think? I chose a simple setting to really showcase the sampler blocks. The blocks are almost in the order that you made them, except block 11 is second in the quilt. For me, it was always second, however, I didn't want you to make it as the second block because I wanted you to use up scraps for the HST's. I wanted to balance the colors evenly throughout the quilt, didn't want all the HST clumped together, and liked the Forget Me Not block as the last block. But...that's just me. You have my permission (you certainly do not need it!) to arrange your blocks in any pleasing order you want. Play with the setting triangles, too! There's a couple of ways you can use them. Make the quilt your own. With my last sewalong, Busy Work, we had a show-n-tell about two months after the last post, and I thoroughly enjoyed that! I think all of you did, too.....so let's do it again!! Send me a photo of your completed quilt top. Your quilt does not have to be quilted or bound!! Please take a photo showing your quilt flat against a wall or the floor. Include your name and the state or country where you live. I will have a give-away to go along with the show-n-tell! Email your photo to me no later than Friday, November ﻿30th. I'm working on the design for another sew-along, coming soon! I can't tell you how much I loved sewing along with each and every one of you! Your comments and block photos were a joy each week. I hope you had fun, and love this little quilt as much as I do. I won't be forgetting the experience any time soon! is quite special. First of all it's dated 1889....just gotta love it for its age! Then...it's RED!!! You know how I love red. over to reveal a piece of white felt, a place to "park" a needle. Thus the high repute of the PARABOLA Needle has oft-times suffered. See that the label reads "R.J. Roberts' Patent Parabola"
You will thus save yourselves from imposition. Okay, then....do tell us how you really feel! Can you imagine seeing this on a package of needles now? I think this is hilarious...I hope you got a smile from it, too! Well....tomorrow morning, dear hubby and I are packing the car and taking a road trip. Our first stop is Cleveland, to visit the Rock & Roll Hall of Fame. after all, he said, you've been around since the beginning. Sigh...thanks, Ryan. Glad you're impressed! enjoy the fall colors, and perhaps fit in a few quilt shops, too! I'll try to blog from the road, Wi-Fi permitting, and will post on Facebook too. I can hardly believe that we've been sewing together six weeks already! Time sure does fly by when we're having fun. This week's sewing is easy, breezy. You'll have this done in half an hour! In the usual manner, draw a diagonal line on the wrong side of the pink squares. Match with a blue square, and sew 1/4 inch on each side of the drawn line. Cut apart and press to the blue. Yup...you're all done! I bet you're wondering how this will all come together, aren't you? The wait is almost over. Next Friday will be the big REVEAL.....I can hardly wait! I've been keeping this a secret for a lonnnnnggg time, and I so want to share the quilt with you. one of our favorite folk art shows of the season! Hopefully, I'll have some good pictures to share with you. I'll bet you'll be spending some time with your sewing machine! I've written a dissertation, and now I'm out for summer vacation! Journey Four to be ready....and ready it is!! I had the best time choosing the subjects for the six historic stories. So fun! snowy winter doesn't depend on what we do now during harvest time! We have it much easier!! back cover shows the remaining five do-able, affordable smaller projects. There are two bonus projects in Journey Four as well. or a referral to a shop offering membership-by-mail! liked blocks 7 & 8. I happen to like them all and don't really have a favorite. 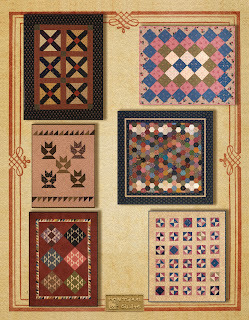 I just love a sampler quilt for that reason. 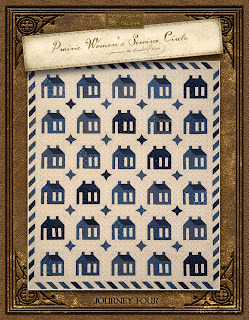 Laurie...please email your snail mail address and choose a Heartspun Quilts pattern prize! with the BIG REVEAL of the finished quilt coming Friday, Sept 28th!! It will be a couple of months yet....so stay tuned! should be back in stock next week. fun, and I thought you'd enjoy them too! with notes about the thimbles she had, what family member they belonged to, and some thimble history. I asked her if I could share the information with all of you, and she was happy to share. so that she might get started on her hope chest. and the person who got it was supposed to have the best luck all year. Thimbles, or thumb-bells (originally they were worn on the thumb) date back to antiquity. No one knows for sure who invented the first one, but it was probably someone who sewed and said "Ouch". Thimbles come in all mediums: aluminum,bone, china, brass, copper, cut glass, gold, horn, ivory-scrimshaw, leather, pewter, plastic, porcelain, steel, sterling, stone, etc. They are: carved, embossed, enameled, engraved, filigree, filleting (bands), gadroon(a series of raised decorative curves as adornments), hand painted, jeweled, moulded, stamped, and two-toned. There are thimbles with jeweled tops, magnetic tops, open tops, razor on the side for cutting thread, needle threaders on the side and looped. Wow...who knew so much could be done to something so tiny? Can you believe it? We've made ten blocks together already, and we're about to make the last two! My, the time has gone by quickly. I purposefully held these two blocks for last because they are scrappy....meaning that you can use some of the scraps you have to complete them. Always fun, I think! Important Note: For these last two blocks, you will be making your Half Square Triangles just a bit differently. Normally, I ask you to draw a diagonal line and sew 1/4 inch on both sides of the drawn line. This yields two identical HST. For these blocks, we won't need two identical HST....we will only need one HST. Therefore, to save on fabric, please carefully follow the directions for each block. Truth be told, this is a nice technique to know should you ever find yourself in the same spot needing only one HST. The math formula is: finished size + 1/2 inch. Just remember to sew "on the line", not on both sides of the line. *Cut (9) 2" squares from assorted light prints for HST. *Cut (3) 2" squares from each assorted blue, pink & green prints for HST. *Draw a diagonal line on the wrong side of all (9) light print squares. *Pair each with a blue, pink, or green square. *Sew (scant) on the drawn line. Notice in the photo that my seam is a thread or so next to the line. This is the same as sewing a "scant" 1/4 inch seam. *Press seams open. Make (9) HST that should measure 2" unfinished. *Arrange the HST units for the block as shown. Pay specific attention to color placement of the blue, pink, and green prints. *Sew units into rows; press seams open. Sew rows together; press seams open. Make (1) block that should measure 5" unfinished. *Cut (2) blue, (1) green, and (1) pink print 2 3/4" squares. *Cut (1) 2 3/4" x 5" rectangle for FG unit. *Cut (2) 2 3/4" squares for FG unit. and green print. Sew on the drawn line. Press to the blue print, trim 1/4 seam allowance. Make (2) HST that should measure 2 3/4" unfinished. *Draw a diagonal line on the wrong side of the (2) blue & pink print 2 3/4" Connector Corner squares. Make (1) Flying Geese unit that should measure 2 3/4" x 5" unfinished. *Arrange the units for the block as shown. Sew together into rows; press. Sew rows together and press. Make (1) block that should measure 5" unfinished. If you're lucky enough to be artistic, (as clearly I am not! 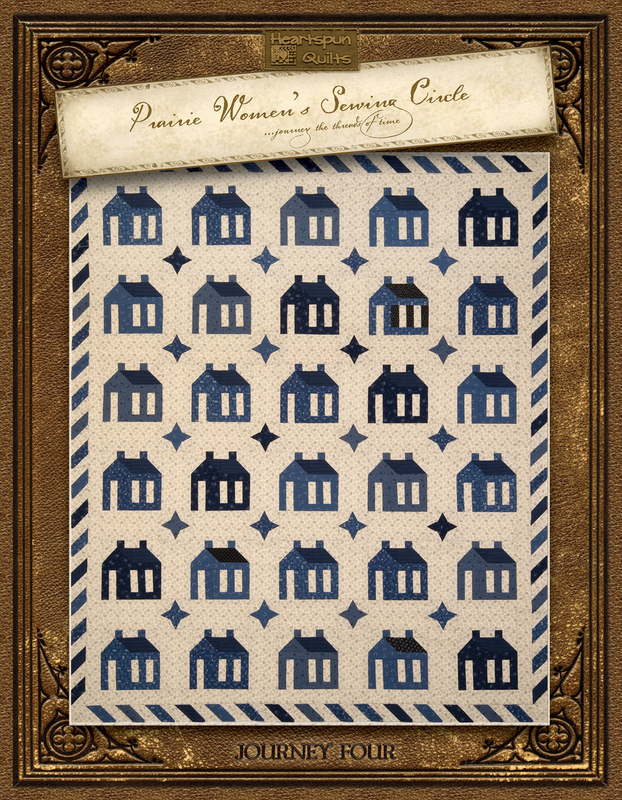 ), you can draw other lovely design motifs as well. Leave me a comment by midnight Saturday, September 15th. The winner will receive the Heartspun Quilts pattern of your choice! Today is day 13 of American Patchwork & Quilting's Pillowcase Challenge Blog Hop! It has been my pleasure to participate in some small way to this most honorable cause. of the women who banded together in the early years of our country's history. and comfort for folks with all kinds of need. I sent out an invitation to my own group of Prairie Women. Let's meet at the quilt shop one evening and sew! One evening last week, we met to sew together at our favorite quilt shop, The Quilt Merchant. off pillowcases they made at home. Thanks, Debby! Even shop owner, Docia Fuller, joined in the fun. neither of us had ever made a French seam, and we wanted to try it! 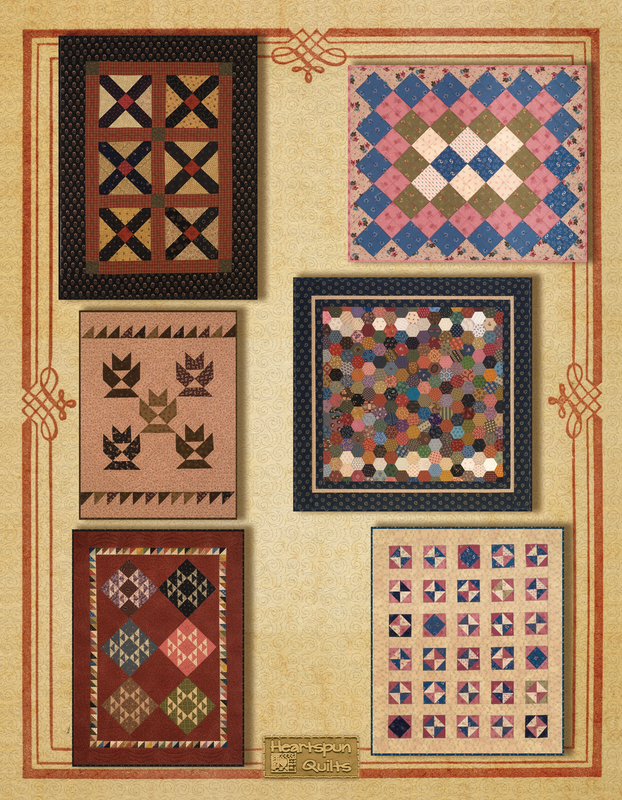 There are lots of pillowcase patterns available from the AP&Q website. I had never made a pillowcase before, and I have to say, it was fun and easy!! to buy these fabrics, and it was great fun to choose some. we all got into a routine, with each one cuter than the other!! fun, cheery pillowcase on the pillow when they arrive. What a nice way to bring a bit of comfort and joy to a child! Please consider making a pillowcase for a worthy cause. Click here to find all of the info you need. If you don't have a favorite charity, or aren't sure where to donate, no worries! Click here to see a long list of charities who would love to recieve your gift! for leading us on such a fun and worthwhile cause!! Well....we're just cruising thru the sampler of blocks, aren't we? Hope you're having fun with them so far!! Did you cast your vote on my last blog poll? I asked you to tell me....what is the smallest finished size Nine Patch block are you were willing to make? I found it very interesting that the majority of you (47%) said you would make a 1 1/2" finished block, with a 3" finished coming in second place (28%). Hhmmm....I'll be keeping that in mind for future projects! My thanks to all who participated in my poll!! It's fun! I've been busy traveling a bit, giving lectures and workshops, which allow me to meet some really great quilters....I love that!! I also met with a bunch of my own Prairie Women Wednesday evening for a pillowcase sew-in at my favorite local quilt shop, The Quilt Merchant, where we teamed up, and made several dozen pillowcases for our local charity. Do visit my blog again on September 13th when it's my turn to post as part of American Patchwork & Quilting magazine's blog hop all this month, all about making pillowcases for charity. Perhaps you can take a short break from stitching your next two Forget Me Not blocks and click over to many of the other participating designers for AP&Q's blog hop. Simply scroll down to my last post to see the list and click on the links!! *Cut (3) 2 3/8" squares for HST. *Cut (2) 2 3/8" squares for HST. *Cut (1) 2 3/8" square for HST. *Draw a diagonal line on the wrong side of the (3) 2 3/8" Light Print #2 squares. Match with the (2) blue print and (1) pink print 2 3/8" squares to make HST. Make (4) blue and (2) pink HST that should measure 2" unfinished. *Arrange the units for the block as shown. *Sew units together in rows; press to create opposing seams. Sew rows together; press. Your block should measure 5" unfinished. *Cut (4) 1 1/4" x 2" rectangles. *Draw a diagonal line on the wrong side of the (2) 2 3/8" Light Print squares. Match with the (2) green print 2 3/8" squares to make HST. Make (4) green HST that should measure 2" unfinished. *Sew (1) light print and (1) green print 1 1/4 x 2" rectangles together; press to the green. Repeat to make (4) strip sets that should measure 2" unfinished. *Sew the units together into rows: press to the strip sets for opposing seams. Sew rows together: press. Your block should measure 5" unfinished. you'll receive your last two sampler blocks! Make A Pillowcase ~ Make A Difference! 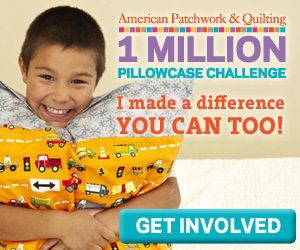 Yesterday, American Patchwork & Quilting magazine launched a month-long blog hop to celebrate their wonderful Million Pillowcase Challenge campaign! They asked me to be a part of this very worthy cause, and I am happy to help! So....we invite you to hop from blog to blog throughout the month of September, hoping to inspire you to make a pillowcase for charity. Be sure to check in with me on September 13th for my blog post! I'm taking inspiration from our quilting ancestors, so be sure to check my blog post to see what I did!! In the meantime.....grab some fun fabric prints, and make a pillowcase for the charity of your choice. If you need some pillowcase pattern ideas, no worries.....click here! You'll find great step-by-step instructions for a variety of pillowcases that are fun and easy to make. Click here if you would like to see a list of places where you can donate your pillowcases. Join the fun and make a difference! !